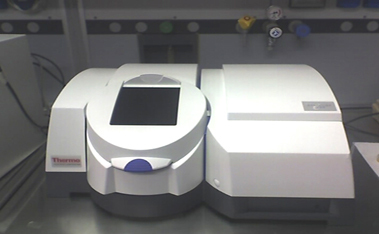 The instrument is designed for analysis in the middle IR (4,000-400 cm-1) and Near IR (12,000-4,000 cm-1). By an electrical heating jacket (Specac) with temperature controller, it is possible to perform measurements in situ at specific temperatures from 25 up to 250°C. 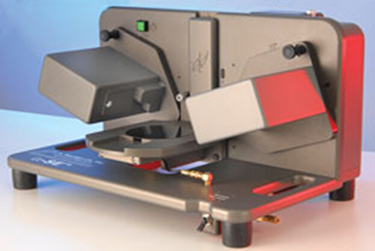 A double-beam instrument for spectroscopic information from the range UV to IR (from 200 to 1100 nm) and is suitable for testing the samples both in solid or liquid form. 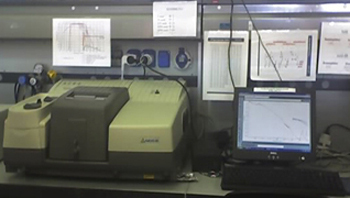 The fluorescence spectroscopy is the analytical instrument for samples containing fluorescent or phosphorescet species. 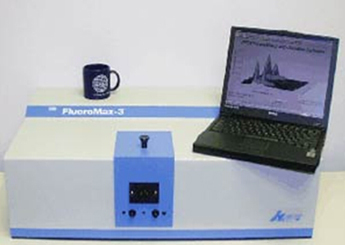 The system allows luminescence life-time measurements and is equipped with integrating sphere for quantum yields evaluation. 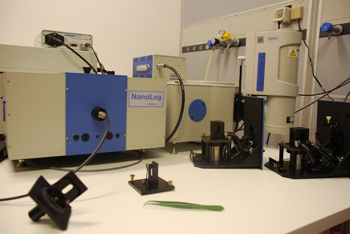 Spectroscopic ellipsometry has become the standard for measuring thin film thickness, surface roughness and optical constants (n and k) of the thin film of all types of materials: biological nature ( film of Langmuir-Blodgett or Langmuir-Schaefer), inorganic and more.